Takshashila (Takṣaśilā), or Taxila as it is better known, is reputed to be the world's 1st university and the finest educational institute of its time in Bharatvarsha. It was an important Hindu and Buddhist centre of learning that flourished from at least 2800 years ago in the kingdom of Gandhara. The university was a hub of over 10,000 students swarming in from different parts of the world to garner knowledge and education which includes those from Babylonia-now Iraq, Greece, Egypt, Syria, Asia Minor-now Turkey, Arabia, and China. The curriculum consisted of some 68 elective courses, including philosophy, law, state-craft, defence, warfare strategies, grammar (several languages), the 18 arts (music, dance, fine arts, etc. ), mathematics, astronomy, astrology, plants & herbs, medicine (Ayurveda, etc. ), and surgery. Some of these, such as medicine, were taught for up to seven years before graduation. The panel of scholars at the university included legendary scholars like Kautilya, Panini, Jivak and Vishnu Sharma. Students were admitted to this university at the age of 16 after they had completed their basic education in their local institutions. Every single graduate who passed out of this university would become a well sought after scholar all across the subcontinent. The archaeological site of Takshashila was designated a UNESCO World Heritage Site in 1980. Takshashila, gets its name from Raja Taksha (King Taksha), who was the son of Bharata (the brother of Rama) and Mandavi. The word Takshashila, in Sanskrit means "belonging to Raja Taksha." Raja Taksha ruled over the kingdom of Taksha Khanda which even extended beyond modern day Uzbekistan, and Tashkent (the present day Uzbek capital also gets its name from Taksha/Takshashila). View from the Takshashila University. In the Indian epic Mahābhārata, the Kuru heir Parikṣit was enthroned at Taxila. According to tradition the Mahābhārata was first recited at Takṣaśilā by Vaishampayana, a disciple of Vyasa at the behest of the seer Vyasa himself, at the Sarpa-Satra Yajna, "Snake Sacrifice ceremony" of Parikṣit's son Janamejaya. 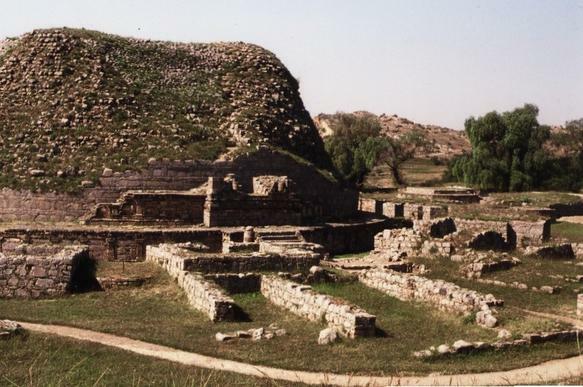 Taxila was regarded as the educational capital of the world by the Greeks, Middle Easterners, and Central Asians. 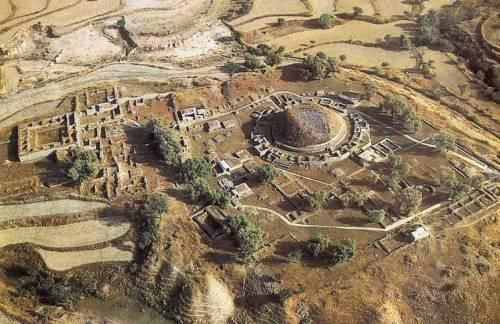 Taxila is described in some detail in the Buddhist Jataka tales. The Jataka literature mentions it as the capital of the kingdom of Gandhara and as a great centre of learning. In 450 BC, the Modern Greek historian Herodotus, with many prospective Greek students, arrived in Taxila to study at Takshashila University, making references that Takshashila influenced Greek culture, and his fellow Greek students became the great philosophers in Greece. At Taxila the teachings were bilingual for the better part of the two hundred years where Greek became the second language. The city of Takshashila is mentioned by the Chinese monk Faxian (also called Fa-Hien), who visited ancient sites of Buddhism in India. He came to Takshashila in 405 CE. In his book "A Record of Buddhistic Kingdoms. Being an Account by the Chinese Monk Fa-Hien of his Travels in India and Ceylon in search of the Buddhist Books of Discipline" he mentions the kingdom of Takshasila (or Chu-cha-shi-lo) meaning "the severed Head" (Chapter 11). He says that this name was derived from an event in the life of Buddha because this is the place "where he gave his head to a man". Xuanzang (also called Hieun Tsang), another Chinese monk, visited Takshashila in 630 CE. He mentions the city as Ta-Cha-Shi-Lo. The city appears to have already been ruins by his time. Takshashila was destroyed by the invading Huns who came from across Hindukush into Punjab in the fifth century, and never recovered. Today, Taxila is situated at the western part of Islamabad, northwest of Rawalpindi, Pakistan, which is the western region of ancient Bharatvarsha. Some of the students who graduated out of the Takshashila university included the great political master Chanakya. Chanakya is also called Kautilya/Vishnugupta who not only authored the world’s finest work till today on political duties, statecraft, economic policies, state intelligence systems, administrative skills and military strategy, called the Artha Shastra (Sanskrit for The knowledge of Economics) which consists of 15 books, but who also guided Chandragupta Maurya as a mentor who founded the Great Mauryan Empire, and also served as the prime minister of the Mauryan Empire. Panini was a great product of this university. He was an expert in language and grammar and authored one of the greatest works on grammar ever written called Ashtadhyayi. Ashtadhyayi means eight chapters and is more complicated and at the same time highly technical and specific defining the features and rules of Sanskrit grammar, like how we have modern day books on computer programming languages like C/C++. Prof. Noam Chomsky of MIT attributes the origin of linguistics to Panini. Vishnu Sharma , the author of the great book that teaches the art of political science in the form of simple beautiful stories called the Pancha Tantra (meaning the five techniques). It is said that Vishnu Sharma wrote these stories in order to convert three dumb princes of a king into able political administrators within a span of six months. A physician who fails to enter the body of a patient with the lamp of knowledge and understanding can never treat diseases. Dharmarajika Stupa at Takshashila University. Jivak was another genius who came out of the Takshashila university. He was a doctor and an expert in pulse reading (understanding the health status of the body by just listening to the person’s pulse!). He studied Ayurveda in Takshashila University for seven years. His areas of specialization was Panchakarma, Marma and Surgery. Jivak was the personal physician of Buddha and also cured the Nadi Vran of Buddha. He also worked with the great classic beauty Amrapali and ensured that she retained her youthful countenance and performed many amazing operations on her using only Marma points and surgical procedures! He also invented a cure for Filariasis. There are over 15000 handwritten manuscripts of Jivak’s expertise passed on by generations to their children and are still preserved in India even today.